This exchange comes from the opening minutes of a 1956 radio documentary recorded at United Nations headquarters in New York and narrated by the well-known television personality Alistair Cooke. Entitled “Friendly Warning,” Cooke’s script captured listeners’ attention with reference to sinister extraterrestrial forces, playing on the cultural atmosphere of an era saturated with comic book superheroes, B-grade Sci-Fi flicks, and all-too-real anxieties about nuclear proliferation. Solar system astronomy was only one piece of the larger International Geophysical Year program. Conceived in the early 1950s by a small group of European and North American scientists, the IGY emerged as a follow-on to earlier multinational programs known as the International Polar Years. It soon developed into an enormous geopolitical event. Between July 1957 and December 1958, some 50,000 scientists from 67 countries—representing disciplines from glaciology and meteorology to geodesy, seismology, and oceanography—collaborated across national boundaries. Their goal: complete synoptic observation of planet earth from core to mantle to outer atmosphere. Today, the International Geophysical Year is generally remembered not as a whole, but through its constituent parts: the launching of Sputnik in October 1957; the confirmation of theories of continental drift; the signing of the Treaty of Antarctica; and the first systematic measurement of atmospheric CO2, leading to the discovery of anthropogenic global warming. Integral to each of these achievements, however, was the larger IGY program, which facilitated vast new systems of data accumulation, storage, and exchange—in turn requiring a delicate balancing act between often hostile political actors, coming from democratic Canada and Denmark, colonial Africa and the Pacific, newly independent states including India, Morocco, and Pakistan, military-led Argentina, and the Soviet Bloc. 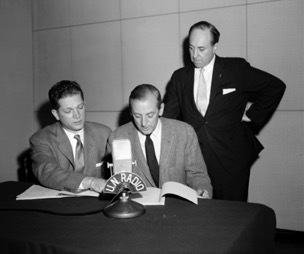 The above photo, which shows Alistair Cooke narrating “Friendly Warning”—flanked by two members of the U.N. Radio Division—is interesting not for its visual extravagance, but for the sparseness of its composition. The image stands in contrast to most publicized iconography of the International Geophysical Year, which more typically appeared as lavish newspaper or magazine spreads: rockets hurtling skyward, icebreakers on their way to Antarctica, complex scientific instruments, island bases and deep sea crews, spectacular sunspots, or observatories capable of studying distant stars. Here we get a more intimate scene—but also one revealing of the vast communications, logistical, and infrastructural networks underlying the IGY’s public exterior. Nevertheless, the history of the United Nations—like that of twentieth-century internationalism more broadly—reflects the myriad legacies of the International Geophysical Year. Particularly in the realm of science, UNESCO developed a spate of projects in the 1960s and beyond that directly or indirectly recreated aspects of the IGY, including the Intergovernmental Oceanographic Commission, the International Hydrological Decade, and the Man and the Biosphere Programme—while norms established by the Antarctic Treaty System provided a model for international environmental regulation from the Partial Test Ban Treaty to the 1972 UN Conference on the Human Environment. Narratives of peace through science may have been overly rosy, but the significance attributed to planetarity was prescient. In our own age of resource wars, resurgent nuclear brinksmanship, and rapid climate change, it is a scale of engagement we cannot escape. Ben Goossen is a global historian of science and religion at Harvard University. His current project, entitled “The Year of the Earth (1957-1958): Cold War Science and the Making of Planetary Consciousness,” is an interpretive history of the International Geophysical Year.